There is not much to dislike! Power and performance is amazing – in any weather (caveat: must have right tires). Absolutely comfortable for 4 adults + luggage. If anything, it’s biggest detractions are that it lacks style and soul – but then again, that’s also one of its selling points. It just depends on what you’re looking for. In short – there are not many performance cars that could survive daily driving in Ottawa. This did – with aplomb. Ottawa Fall Colors ’09 #78, a photo by rdonovan on Flickr. I admit it. Jeremy Clarkson was right. 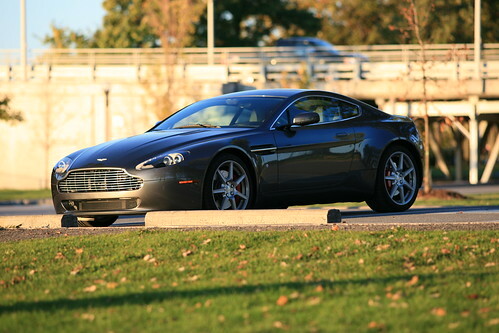 Those who bought the V8 Vantage would probably just end up wishing they buying a DB9. I can now count myself in that boat, having worked a trade of my V8 Vantage for a DB9. There are many things to like about the Vantage. First, the sound. It sounds like a proper sports car. Nothing else sounds like it. Second, the handling – it’s brilliant and like playing a video game. You can feel every nuance of the road. The performance is very good – but you have to push the car psychotically hard to get at it. This is a matter of preference. I am in the camp where I would prefer something more fluidly available. The lack of front park distance control makes parking a challenge. As you can’t see a bloody thing out the front. But the sie makes fitting into narrow spaces a breeze. However, what absolutely, totally did it for me was the transmission. It is an Italian-designed F1 paddle-shift with computer controlled clutch. And it’s horrible. Yes, it can shift in milliseconds. But that isn’t that useful in every day life. The fact that the clutch burns and grinds in parking lot or stop-and-go-traffic is annoying. Even more annoying is when you can’t get at the gear you want. More annoying still is stopping – and starting – while you agonizingly wait for the clutch to engage. And hope it does before the car coming in the opposite direction nails you. Or, when it engages – it ENGAGES and you are off with a huge streak of burning rubber. 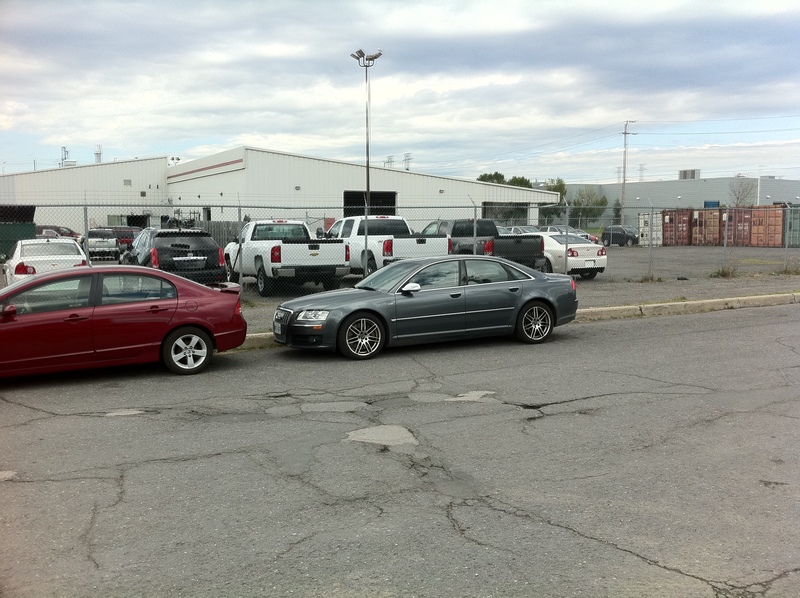 But what absolutely did it was a catastrophic failure to proceed leaving the car stuck in neutral – and a $550 towing bill to get it to the dealer in Montreal from Ottawa. And finding out this kind of failure isn’t at all uncommon. And costs $10K+ to rectify out of warranty. So with a year left on the warranty, it’s time to find something else. And that something else will be a DB9 – with an automatic. The Vantage is a great car – but if you get one, get a 6-speed. Moving to the Northeast and Ottawa has been quite an adjustment from an automotive pursuit. In Seattle you are spoiled with weather that permits driving any car that can withstand rain all year long – on salt free roads. And parking is plentiful. So is the ability to get exotic cars serviced. Ottawa is filled with snow and salt. This means an all-wheel-drive vehicle that can withstand salt. And anything else has to stay in the garage for half the year. Parking is not plentiful – spaces are small. Most people take the bus/train (except when there is a strike – sigh). 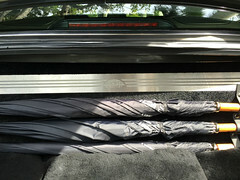 And getting an exotic serviced – you will be driving to Montreal or Toronto. This has caused a reset of my automotive hobby. My daily driver, a Land Rover Range Rover Sport HSE, fits right in. But for a “fun” car – neither of the Bentley’s are a fit – both size-wise or service-wise. So with reluctance I parted with my 2005 Continental GT and my 2000 Arnage R. The Continental is not a car I will miss – it is an excellent automobile but it lacks the kind of quirky character I desire in a British car. The Arnage is everything I ever wanted in a British saloon. I will miss it dearly. But, the Arnage of my desire is not this example – but actually one of the Series II cars made between 2005-2009, preferably a special series such as the Blue Train, Diamond, Concours, or Final Series. And it certainly does not fit an Ottawa lifestyle. 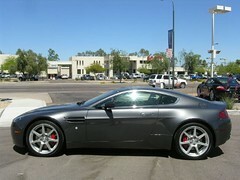 So with fondness I bid these wonderful machines farewell – and welcome a brand new Aston Martin V8 Vantage. I never thought I would ever own a new Aston Martin. But, year-end specials made that an extremely attractive option – and less expensive than most pre-owned examples. This car also happens to be fully loaded – in my favorite color scheme (identical to 007’s). (In other words, if I commissioned a new example – it would be identical to this car.) It is not a winter-driver, but can at least be serviced in Ottawa. 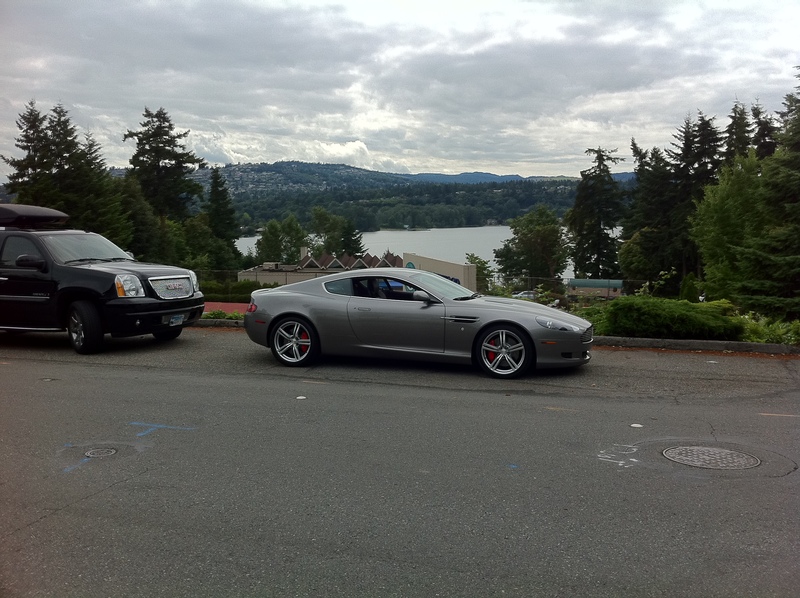 My DB7 Vantage was my favorite of the sports cars I owned. My only criticisms were size/weight and lack of luxury amenities. The V8 Vantage addresses both of these in spades – being significantly smaller, lighter, and gadget-laden. 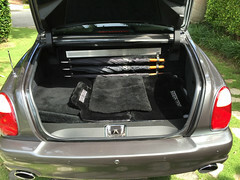 It also has the ironic benefits of great mileage and cargo capacity – qualities not associated with tiny sports coupes. I decided that it would be a good idea to drive the Bentley Arnage from Seattle to Ottawa. I set out on a beautiful morning in Seattle in early October. 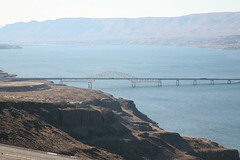 I made it through to Missoula, Montana without incident – and saw some extremely beautiful sights along the way. Between Missoula and Butte, record-setting snow set in. 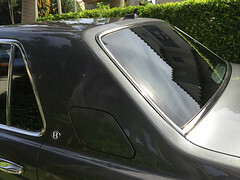 The Arnage is a rear-drive car. It does not handle snow well. It uses tires that were designed specifically for it – and there are no snow tires available that will fit. The traction control proved to be useless – all I ended up doing was losing all power – and having to turn it off. The car was retrieved a week later after the record-setting snow thawed out – and the roads were again passable. Given that I live now in a city that is under snow almost half of the year, this requires some re-thinking. Hmm…in the meantime – enjoy the snapshots from earlier in the day at: http://flickr.com/photos/rdonovan/sets/72157608189691237/.